It’s a question I’m often asked by friends, family and strangers. And it’s a valid one. I’m being invited to experience a menu and to share the experience with anyone who finds their way to my corner of the internet. So if the food is awful it’s a bit of a predicament, right? But over the years I’ve come to learn that if a restaurant or hotel invite me (or any blogger for that matter) to cover them in a blog post, chances are they’re pretty damn confident in what they have to offer. Which is great because whilst it’s been very rare, I always write honestly even if the experience hasn’t been good. In this most recent review, I couldn’t help but identify this underlying confidence endearingly personified in a member of staff. He cheerfully made comments as he walked past our table of, “Phwoar that looks nice doesn’t it!” and ,”It’s good right?” It was brilliant to see staff so proud of the food that was being served and I chuckled every time he came past! 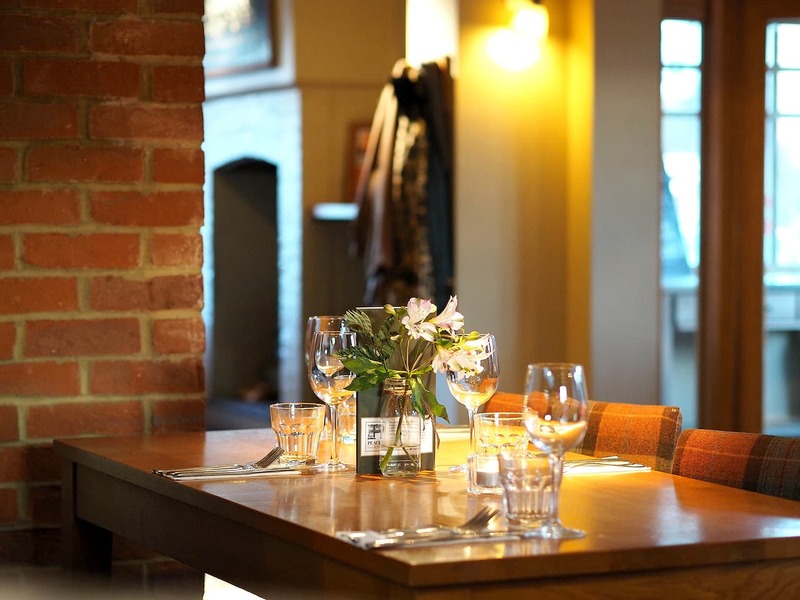 It’s a theme I’ve become familiar with as I’ve covered Peach Pubs over the last month; they seem to pick their people incredibly well which translates into a fantastic atmosphere. 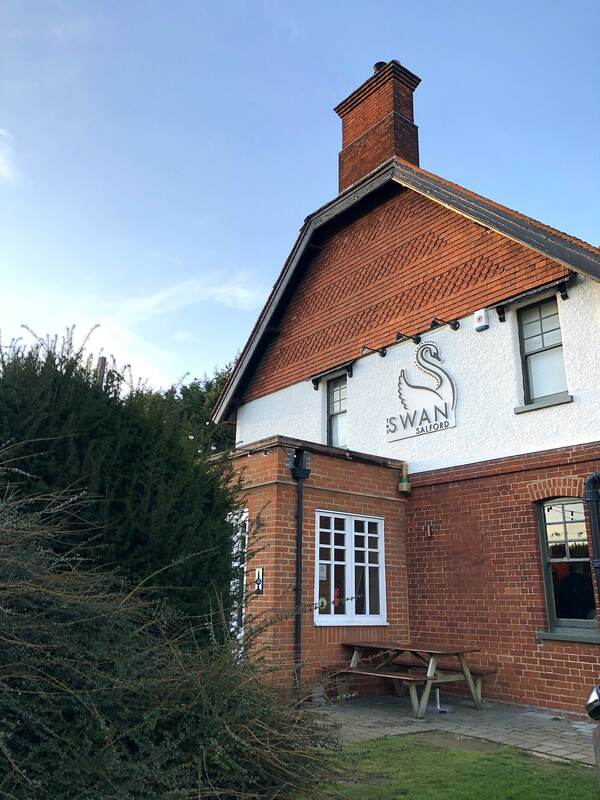 I’m no stranger to The Swan; I’ve been here numerous times for MK Bloggers meet ups and family meals. It’s a pub that unlike so many others I don’t assign to one season. 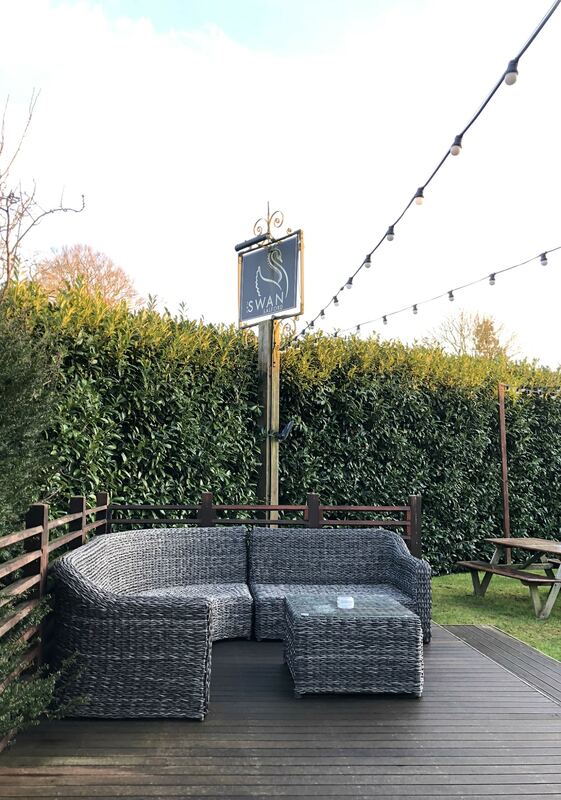 I tend to have a repertoire of Winter and Summer hang outs, but The Swan serves well as an all-rounder. 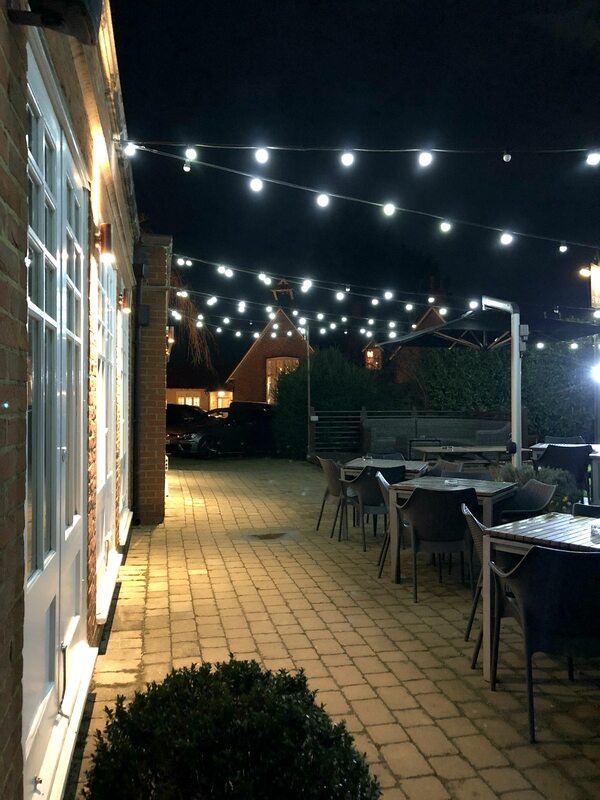 So here I was on this occasion to try out their brand new Spring menu, which fittingly fell on the first week after the clocks changed which meant the first evening out where we arrived in daylight. Hoorah! I was hopeful that going for dinner mid-week it would be quiet and I could evade any sidewards glances from other tables, looking at the weirdo with the camera. But The Swan was popular as ever with more tables than not filled. Nibbles, as always, were a lovely start to the meal and saved a gannet like myself from impatiently waiting on a starter to stave off my hunger. Q and I chatted and picked at the olives which were marinated in garlic. We chuckled and apologised to each other as neither of us held back on enjoying them! 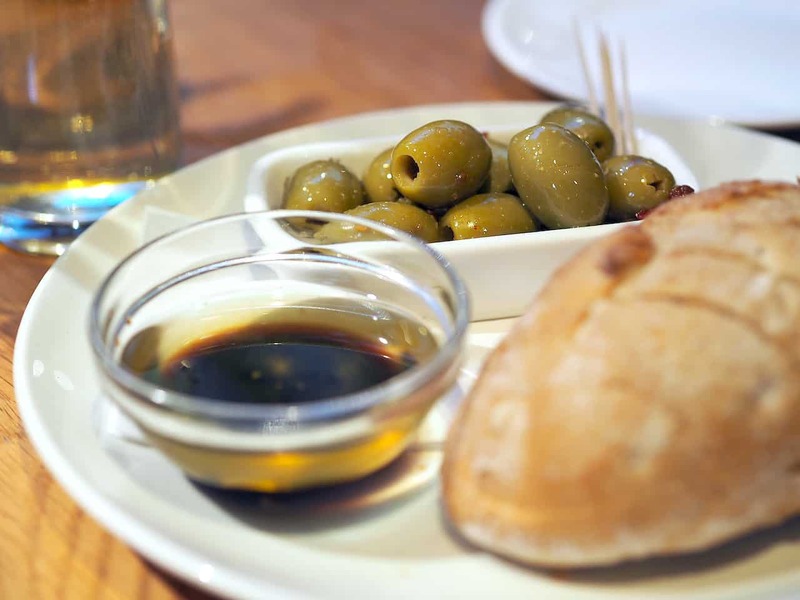 A sharing platter of olives, warm mini loaf with butter or oil will set you back £6.25. 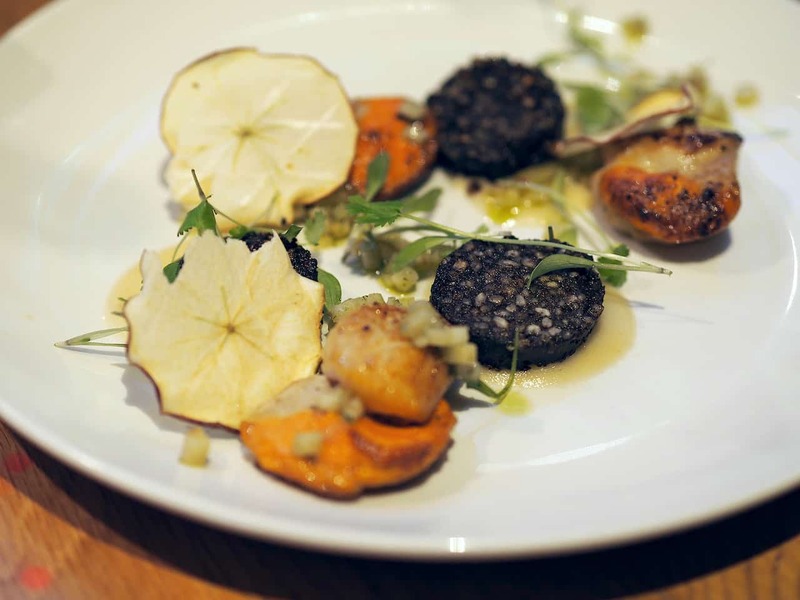 It was my starter of scallops and black pudding which set off the endearing team member with his comments of how tasty the food looked. And he wasn’t wrong: three plump and tender scallops served whole with the roe, accompanied by that small & mighty Clonakilty black pudding which Q and I had also enjoyed in Warwick. The dish is lifted into Spring with a delicate apple dressing and pretty, decorative apple crisps. 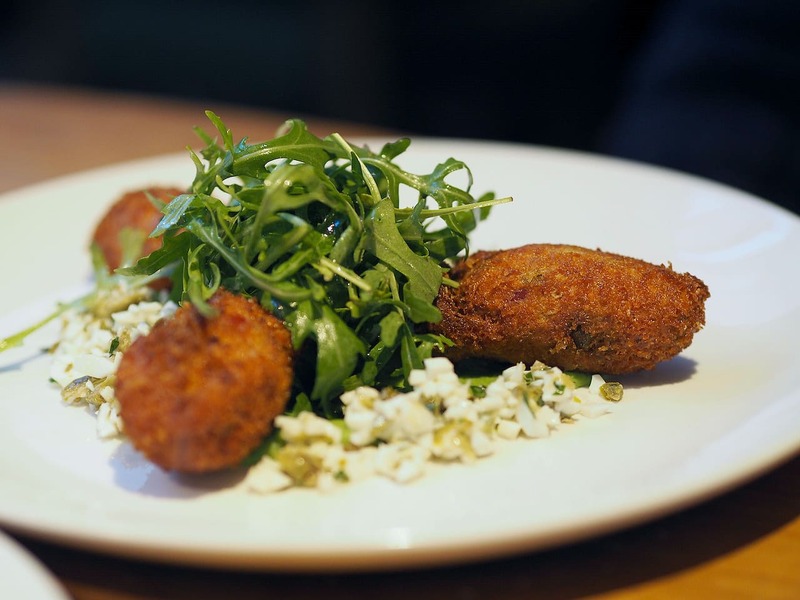 We all know that Q loves a croquette, so the (delightfully crispy!) 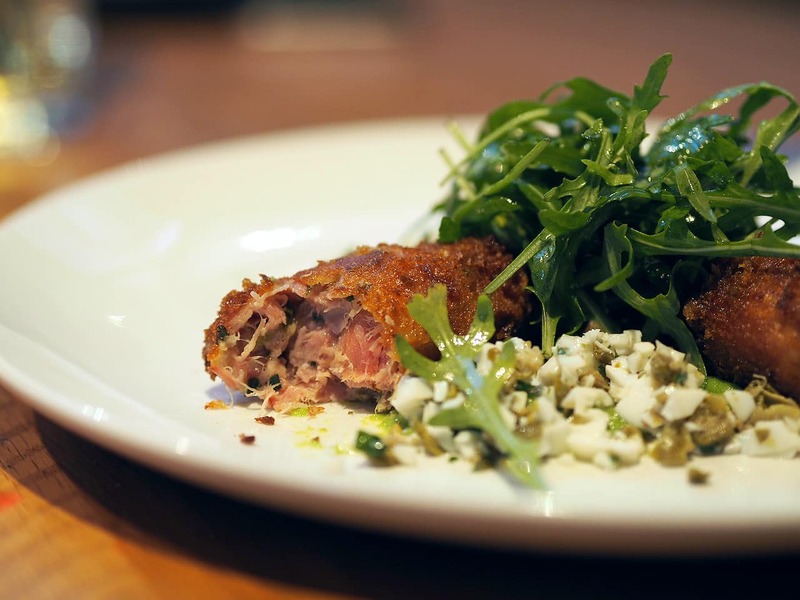 ham hock croquettes with pea puree and sauce Gribiche caught his eye on the menu. It was a pleasant surprise on cutting them open that they weren’t filled with heavy potato but pure, meaty chunks of ham hock. There goes that Spring menu twist again: this was a lighter, fresher version of its usual starchy form. A spring menu ain’t a Spring menu without the presence of lamb. Q and I agreed that one of us had to order it. 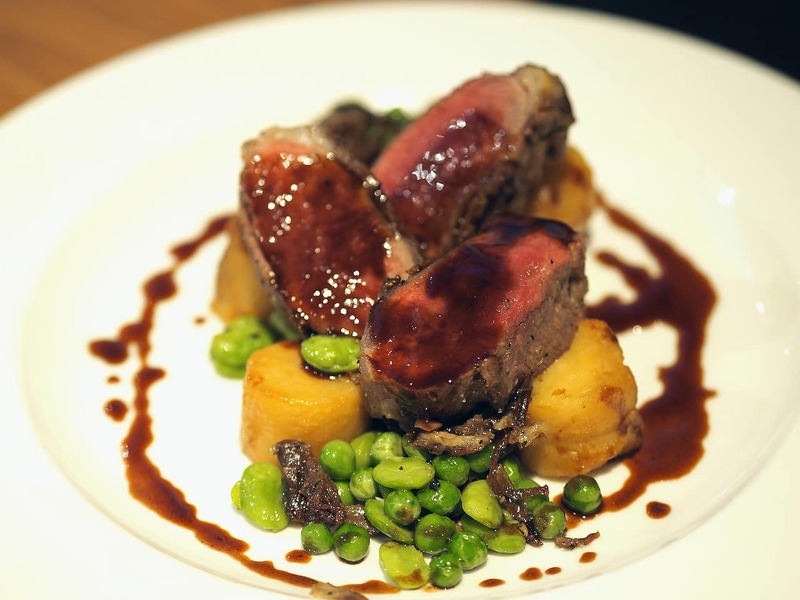 Cannon of lamb with fondant potato, peas & broad beans and lamb jus. Simple ingredients executed very well. On ordering Q was asked if he would prefer his lamb pink or well done, so The Swan do offer their guests the choice. Not that in my opinion there’s any choice to make… pink or not at all! It arrived perfectly blushing and complimented by the concentrated meaty flavours of the jus. This is the priciest dish on the Spring menu at £22.50. 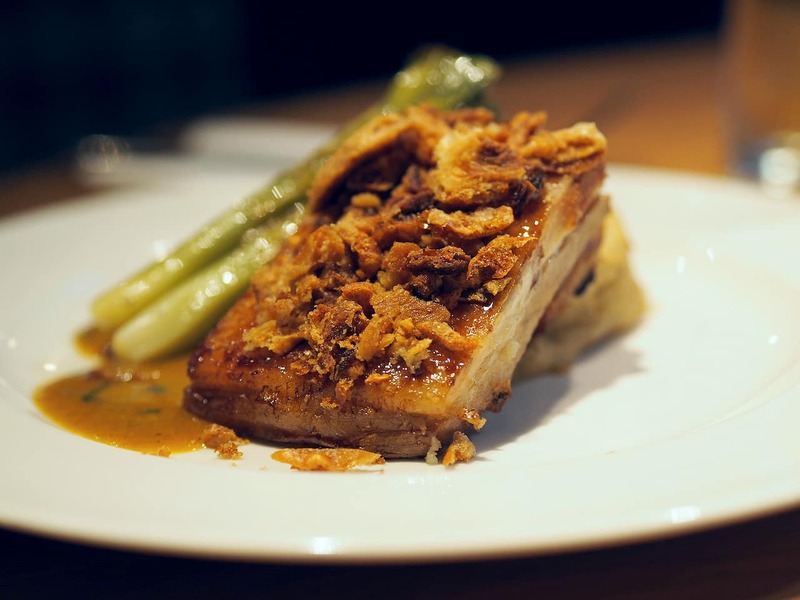 So you know I have this rule about not ordering belly pork, because my mum’s is unbeatable. But it just sounded so good this time that I had to go for it. Accompanied by a generous potato cake lifted with aromatic fennel, adorable baby leeks and a rich tarragon sauce. The crackling arrives as crispy chunks jeweling the top of the pork, which was cooked very well and (okay, still doesn’t beat mums) extremely tasty and juicy. The leeks were a surprising MVP of this dish: so tender and sweet! I thoroughly enjoyed all the aromatic flavours in this dish. I haven’t had pannacotta in forever. I always think that cold & creamy is a really pleasant way to finish a meal, especially if you’re quite full. 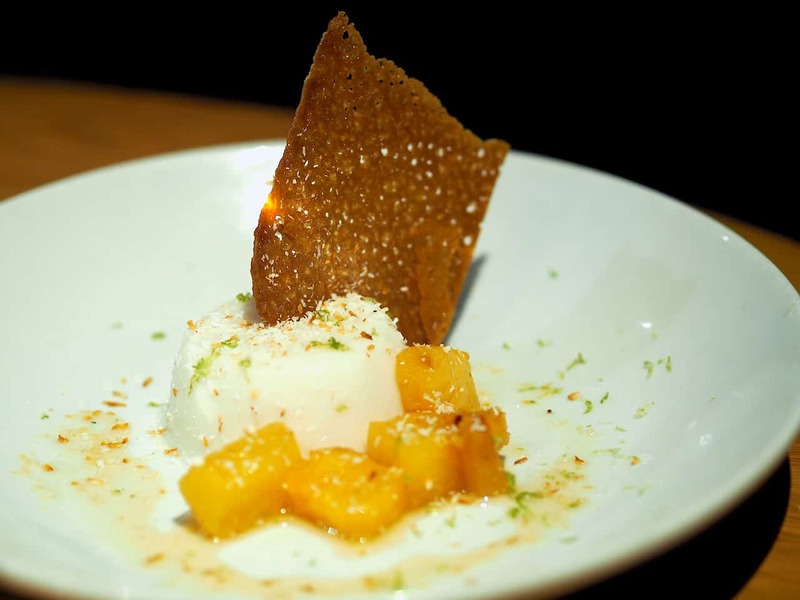 The Swan’s coconut version was just what I wanted with flecks of fresh lemon zest, although the dusting of desiccated coconut wasn’t quite my bag as it interrupted that creamy texture that I love so much. The crunchy brandy snap was however a lovely contrast in texture and the dish is finished with super sweet chunks of rum-glazed pineapple. £6.50 for this number. In just a few months I won’t be admiring the pretty fairy lit garden, i’ll be soaking up the sun in it! Yep. It’s a great year-rounder this pub. 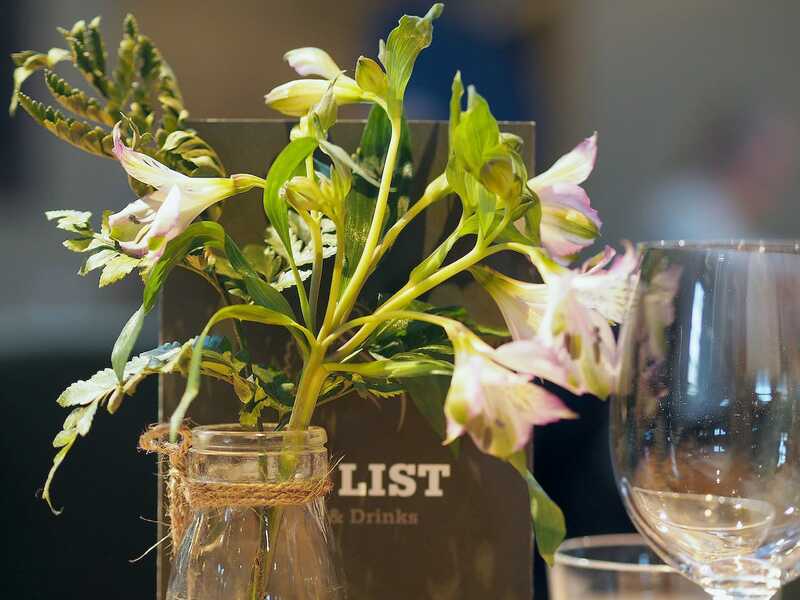 The Spring menu hints at a little less starch and a little more veg, more citrus and more delicate herbs. 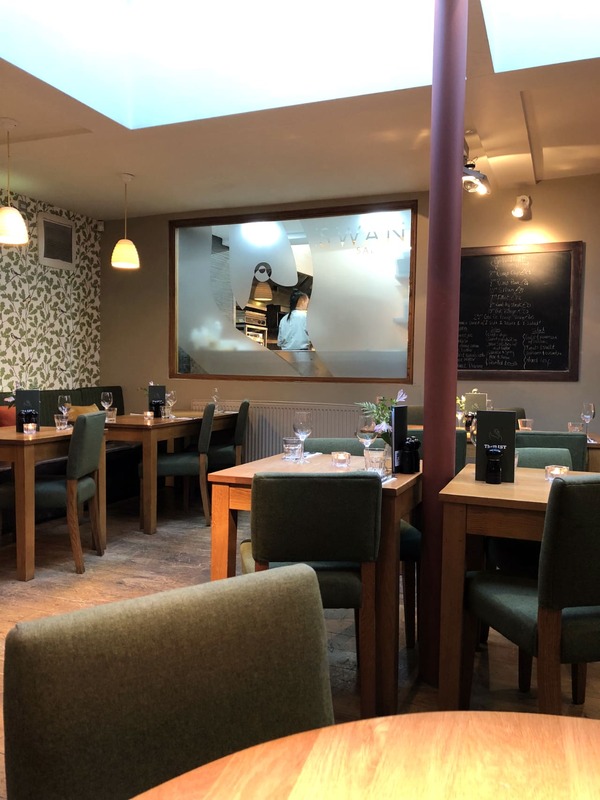 The Swan is right to be confident of their new menu.